The Tutzing Motherhouse, located near the Alps on Lake Starnberg, is not only the German Sisters' spiritual home. No, every sister of our Congregation is happy to get to know the monastery of our origins and the picturesque place imprinted by our name. Germany is the homeland of our Congregation. Here we were founded. From here we send out missionaries to many countries of the world to proclaim the Good News of God's Kingdom in word and deed, and also to plant seeds of monastic life. These blossomed in such rich fullness subsequently that today, non-German sisters constitute two-thirds of the Congregation. Today four houses belong to the Tutzing Priory: the Motherhouse, Ettiswil, Bernried, and Dresden. In 2015, as we look back upon 130 years of our history, there are more than 1300 women living as Missionary Benedictine Sisters of Tutzing. Our history began in 1885 at Reichenbach, where Fr. Andreas Amrhein had started Benedictine life with a few young men as “Benediktus-Missions-Verein” in 1884. They hoped to work as missionaries in Africa. Their motive was carrying the Good News to people who had not yet heard of Christ. Since he was convinced that the cooperation of women, that is sisters, would be needed, he presented his idea during the “Katholikentag” at Muenster, where he succeeded in inspiring four young women to join him. Two years later the small community moved from Reichenbach to St. Ottilien, from where, already in 1887, the first brothers and sisters were sent out. In spite of great difficulties at home and discouraging news of fatal illnesses and attacks in their first “mission land” in East Africa, both communities grew rapidly, and lack of space made another move necessary for the sisters. Their positive development is largely due to their first prioress general, Mother Birgitta Korff (1895-1920). In spite of her youth, she showed great leadership talent, joined to loving concern for the well-being of each sister. Tutzing on Lake Starnberg was the choice for the new convent, and in 1904 the sisters transferred to the newly-constructed motherhouse. At this time the community numbered 119 members. This step towards independence proved favorable for the future, leading the community into world-wide development. Along with the steadily-growing number of sisters came increasing foundations in other countries, Brazil, the Philippines, Bulgaria, and South Africa. There were years of flowering and growth! At first consisting of German sisters only, internationality is an important characteristic of ours now, for many women of other nations have joined us, building up and carrying on in our priories. Today sisters from 26 nationalities belong to us. 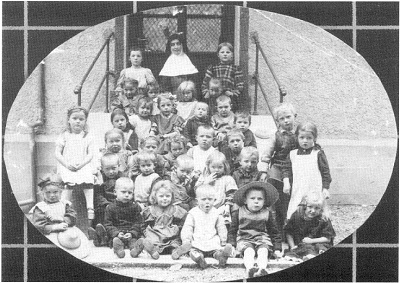 New Foundations in Germany and Switzerland From the very beginning in Tutzing, the sisters served in the education of children and youth in kindergarten and varioustypes of schools. Care for the sick and elderly also was given by Tutzing Priory. 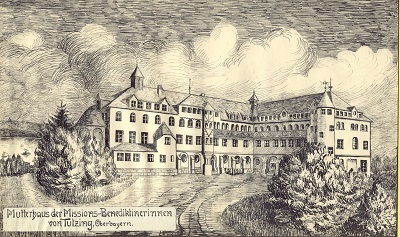 In addition to the motherhouse, further communities and services were added, such as the large farm in Kerschlach, which for decades supplied food for the sisters, then Wessobrunn, the ancient Benedictine monastery, which received sisters in need of rest and later was for a longtime a recovery home for children. Further foundations were made in Olpe (youth center), in Switzerland, our founder’s native country (Duedingen, then Fribourg and now Ettiswil, an old folks’ home), in Weiterdingen (recovery home for mothers), and shortly after World War II Bernried, a monastery near Tutzing, which is today a spiritual center for adults and also houses the novitiate. 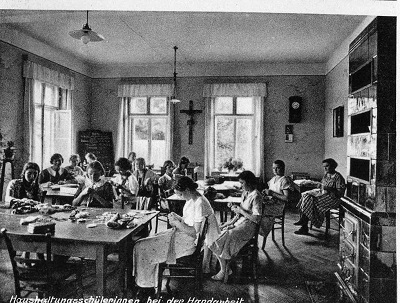 The most difficult for our priory were the years from 1933 to 1945, when Germany was ruled by the National Socialists.At this time the work of the sisters was systematically curtailed, and in 1941 the motherhouse was finally confiscated. Most of the sisters had to leave the motherhouse and were obligated to serve as nurses in Munich and St. Ottilien. The motherhouse was also transformed into a military hospital. During this time sisters only could make profession secretly at our Kerschlach farm. Immediately after the end of the war, in May of 1945, the motherhouse was returned to us. At the request of the parish, the military hospital was turned into a general hospital and until 2007 continued under the direction of the sisters. Some of the sisters still serve there fruitfully as doctors, nurses, and pastoral ministers. Germany clearly is becoming a “mission land.” When the separation between West and East ended in 1989, our priory soon was asked to make a new foundation in East Germany, where only 20% of the people are Christians. In 1992 a small community was established in Dresden. The sisters rented a home in the city center and are contributing their services in various areas (parish, hospice for the sick, work with refugees). Along with this new foundation, we have, because of aging communities and the small number of younger sisters, been obliged to discontinue services and close communities. In spite of difficulties, our priory is open to the needs of the people, especially the poor of our day. At this time, many refugees are coming to Germany from the crisis spots of the world. In Tutzing we have set aside one building to accept women in need of a home. This is our answer to the call of Pope Francis.